Unless selecting at the very top of the NHL draft, a team’s picks will always be poked and prodded by pundits and fans alike, attempting to glean the barometric pressure not only of the present, but especially the future of the team. Draft analysis, in and of itself, is merely an effort to quantify possibilities; what one might consider a great choice, another may well deem it a tremendous reach. Furthermore, consensus selections can bust, whereas long-shots occasionally do come in. The San Jose Sharks went into the 2012 draft arguably thinner in the forward ranks of their prospect pool than in any other position. At center, Freddie Hamilton, Travis Oleksuk, Tommy Wingels, Cody Ferriero and Sean Kuraly led a so-so group devoid of blue-chippers and, aside from Wingels (who played 33 games for the Sharks in 2011-12), unlikely to significantly impact the team in the short term. The right wingers were headlined by 2011 2nd round pick Matt Nieto, 2010 3rd rounder Max Gaede, and AHL’ers James Livingston and James Marcou. On the left side, the talent was particular lacking, as John McCarthy, Brandon Mashinter and Tony Lucia were 25, 23 and 24 respectively, and had yet to make an impact. Thus, it was little surprise that the Sharks made offense their priority this year, drafting center Tomas Hertl (17th overall), center Chris Tierney (55th), right winger Christophe Lalancette (109th) and center Daniel O’Regan (138th) with their first four selections. Rounding out their draft, the Sharks picked defenseman Clifford Watson (168th) and Joakim Ryan (198th) with their final two choices. The draftee most likely to positively impact the club in the near term, of course, is first round selection Tomas Hertl. Due to the machinations typically required by contending teams generally at the trade deadline, Hertl represents only the Sharks’ second first-round pick since 2007. Charlie Coyle, the other first round choice, was traded away last year in the Brent Burns deal. Thus, San Jose is in the relatively unusual position of likely retaining and developing a high draft pick, which explains the relative lack of top-end talent presently within the developmental pool. Sharks General Manager Doug Wilson characterized Hertl as “a versatile guy”. Hertl, a real-life Sharks fan, had five points in six games at the World Junior Hockey Championships this year, and is anticipated to remain in the Czech Republic for one more year before possibly joining San Jose for the 2013-14 season. One might argue his main job is to eat, at least for now. Watson was the first of two defensemen the Sharks took in their final two picks of the draft. 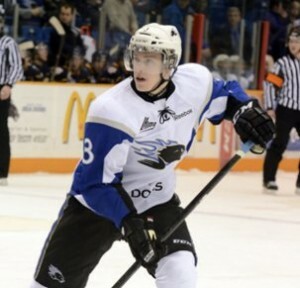 At 6’2″ and 188, he’s already got NHL size, although he still just 18 and has years of development ahead of him. “I’m more of a stay-at-home defenseman, good first pass, good stick and physical in front of my net, physical on the ice in the corners and stuff,” explained Watson. He also said others have compared him to Chris Pronger. Like a number of teams that always make the playoffs, San Jose is rarely blessed with high-end draft picks. Having said that, it would appear that Hertl has the ability to hurdle through the impediments and reach the NHL in relatively short order. The remaining prospects are likely further away and need to eat their Wheaties before even thinking about stepping onto an NHL rink. However, on an overall basis, the Sharks appeared to adequately address needs within their prospect ranks and certainly hope at least a few of them pack the pounds and rise all the way to circumnavigating the HP Pavilion sometime soon. Joe Thornton ain’t getting any younger.